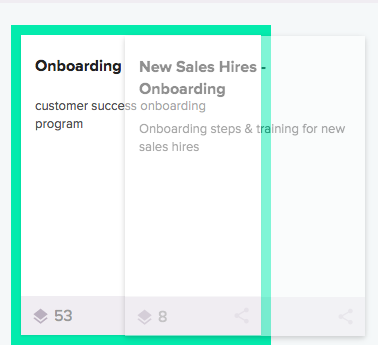 Boards allow you to organize your cards by topic and publish them to your team. 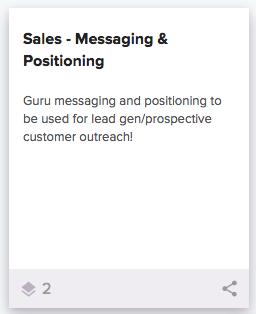 As an example, you can now organize all of your cards about your competitors onto a Board called Competition for easy consumption by your team either in the Guru extension or via our web app. In the extension, you will see a icon in the Main Menu for Boards. When you click on this button, you will see any Boards that have been created for your team. Click on a Board to see all of your cards organized in list view on that Board. You can also search to find specific cards within the context of that Board. If you click the eye button across from All Boards in this menu, it will pop you out into a full page in your browser for easier viewing and editing. How can I create a Board? You can create Boards from the full page in your browser by clicking on '+ New Board' in the Main Menu of Boards. From there, you can give it a title, description and add as well as organize Cards on the Board. 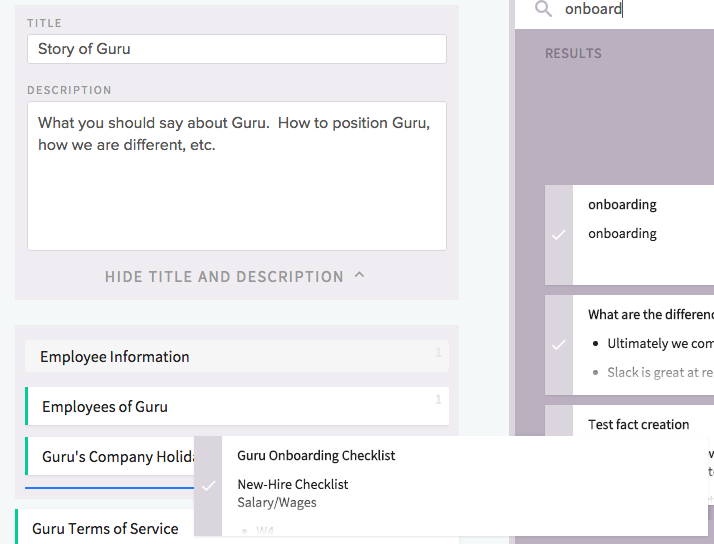 Once the Board is created, your team will be able to view and use that Board from the extension or web app. To add Cards to the Board you can use the search bar to find Cards and then drag them onto the Board. To drag multiple Cards at once simply select the Cards you would like and then you can drag just as you did with one Card. As a note, the Cards will not be added to the Board until the blue position indicator line appears. Additionally, to add Cards to a Board in bulk you can use the Card Manager. Can I create a collection of Boards? You certainly can! 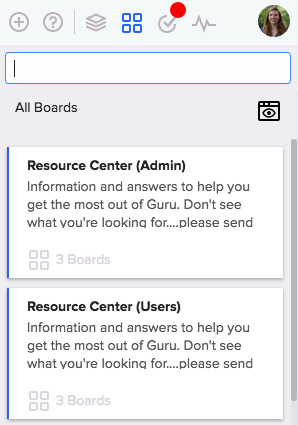 From the main menu, simply drag a Board into another Board (like you would with apps on your mobile device) and it will create a board collection that you can name and contribute boards to. How can I create Sections for Cards on my Board? 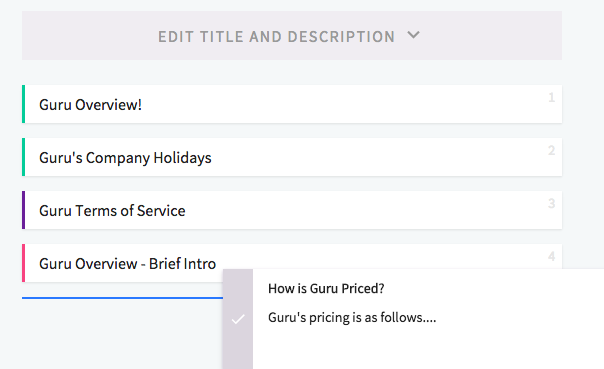 You can use the 'Add Section' option to organize and visually segment cards on a specific Board. Simply click the 'Add Section' button, title the Section, and drag Cards either from the Board or search area into the Section. As a note, the Cards will not be added to the Section until the blue position indicator line appears. 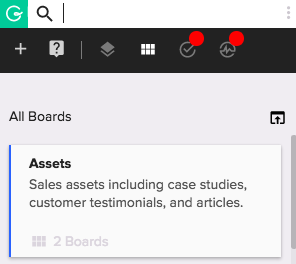 Yes, you can share or link directly to Boards by clicking the share icon and share directly with your team, allowing them to open the Board for easy access or view the Board on their mobile device.